I am a two-time breast cancer survivor. I was diagnosed with cancer for the first time in my twenties. I had the rare distinction of being treated at the same time as my mom:( My mother was diagnosed with breast cancer in 2003 and about 6 months later, so was I. Sadly, my mother is no more. But I am now 7 years into my first survivorship. In early 2010, I was diagnosed with a new cancer. I completed treatment for that as well. I have had 16 chemotherapy sessions overall, radiation therapy and multiple surgeries. I am currently single. The first time around, I was between jobs. After I had gone through the shock phase and the intense medical phase I thought, now what? While so much time and effort is spent on actual treatment (rightly so), it is a challenge to put it past you and move on. I wondered if I would get a job again, if I would be able to travel, if I would get my energy back ..... Now several years later, I am glad to say that most of these things fell in place. The hope of this site is to eventually provide support on professional, social and emotional aspects during and post cancer. The attempt is to offer a way for people in India to connect locally with other survivors, to get inputs and ideas from people who clearly 'understand' and finally, perhaps to forge new bonds. What have I done since cancer? Can we have a sense of normalcy after that and enjoy life? I now head the software development for a US based startup from India. 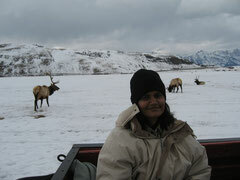 I have been on a sleigh ride and at an elk refuge. I have watched several IPL matches at the stadium and the Chennai Tennis Open a couple of times. I have sponsored a child's education. What I am still working on? Fear (I have the edge at this point but it is not yet conquered). Companionship and new friends -- lagging behind on that. I have been blessed with an incredible family. Their physical, emotional and financial support has been immediate, unprompted, and unwavering. I am also deeply grateful for the medical professionals in my life - my doctors, nurses, technicians, support staff have been wonderful. "Play the best hand possible with the cards that you have been dealt with." "Don't let cancer be your life, put it on the back burner".